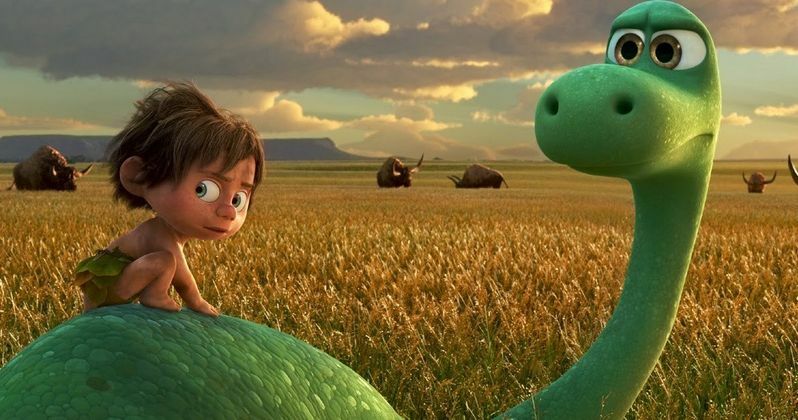 Will Pixar's Good Dinosaur Overtake the Thanksgiving Box Office? Just like its predecessors, The Hunger Games: Mockingjay Part 2 dominated during its opening weekend at the box office. However, it debuted with a franchise-low $101 million, and many are wondering if it will be dethroned already in its second weekend in theaters, going up against three new releases, Pixar's The Good Dinosaur, Warner Bros.' Creed and 20th Century Fox's Victor Frankenstein, all of which open tomorrow, November 25, in lieu of the Thanksgiving holiday. If The Hunger Games: Mockingjay Part 2 suffers a decrease of more than 50%, and the projections at Pro.BoxOffice.com are accurate, than The Good Dinosaur will reign supreme this weekend. Pixar's The Good Dinosaur, which opens in roughly 3,600 theaters, is projected to take in $60 million, which should be more than enough to take down The Hunger Games: Mockingjay Part 2, as it will likely drop to second place with an estimated $50.4 million. The Good Dinosaur is already a hit with the nation's critics, earning an impressive 86% Fresh rating on Rotten Tomatoes. The Hunger Games: Mockingjay Part 2 is still faring well with critics, with a 71% Fresh rating, but its predecessors have all dropped more than 50% on their opening weekend, which isn't a surprise since blockbusters like this are normally front-loaded. The Good Dinosaur asks the generations-old question: What if the cataclysmic asteroid that forever changed life on Earth actually missed the planet completely and giant dinosaurs never became extinct? The film is a humorous and exciting original story about Arlo, a lively 70-foot-tall teenage Apatosaurus with a big heart. After a traumatic event rattles Arlo's tranquil community, he sets out on a quest to restore peace, gaining an unlikely companion along the way-a young human boy named Spot. The voice cast includes Raymond Ochoa, Jeffrey Wright, Steve Zahn, A.J. Buckley, Anna Paquin, Sam Elliott, Frances McDormand and Marcus Scribner. Creed is expected to open in third place with $24 million, although the final tally may be higher, given the incredible critical reception it has received thus far. This spinoff of the Rocky franchise, which debuts in roughly 3,350 theaters, has an astounding 95% "Fresh" rating on Rotten Tomatoes, with Sylvester Stallone and Michael B. Jordan's performances already being hailed as Oscar-worthy by some critics. Adonis Johnson (Michael B. Jordan), whose father Apollo Creed died before he was born, heads to Philadelphia, the site of Apollo Creed's legendary match with a tough upstart named Rocky Balboa. Once in the City of Brotherly Love, Adonis tracks Rocky (Sylvester Stallone) down and asks him to be his trainer. Despite his insistence that he is out of the fight game for good, Rocky sees in Adonis the strength and determination he had known in Apollo-the fierce rival who became his closest friend. Agreeing to take him on, Rocky trains the young fighter, even as the former champ is battling an opponent more deadly than any he faced in the ring. Victor Frankenstein is expected to take fourth place with $13 million, opening in 2,700 theaters nationwide. James McAvoy stars as Victor Von Frankenstein and Daniel Radcliffe stars as Igor in a unique, never-before-seen twist on Mary Shelley's classic 19th century novel. Told from Igor's perspective, we see the troubled young assistant's dark origins, his redemptive friendship with the young medical student Victor Von Frankenstein, and how he becomes eyewitness to the emergence of how Frankenstein became the man-and the legend-we know today. The supporting cast includes Jessica Brown Findlay, Andrew Scott, Freddie Fox, Bronson Webb and Adrian Schiller. Spectre is expected to round out the top 5 with $7.5 million in its fourth frame in theaters. Rounding out the top 10 will be The Peanuts Movie ($6.9 million), The Night Before ($5.8 million), Secret in Their Eyes ($3.9 million), Love the Coopers ($2.7 million) and The Martian ($1.6 million). With no films in limited release expanding this weekend, there shouldn't be many surprises in the bottom half of the top 10, but there are a few notable films opening in limited release. The Danish Girl, another awards season contender starring Eddie Redmayne, Alicia Vikander and Amber Heard, opens alongside a pair of documentaries, Janis: Little Girl Blue and Killing them Safely. The Danish Girl is inspired by the true story of Danish painter Einar Wegener and his California-born wife, this tender portrait of a marriage asks: What do you do when someone you love wants to change? It starts with a question, a simple favor asked of a husband by his wife on an afternoon chilled by the Baltic wind while both are painting in their studio. Her portrait model has canceled, and would he mind slipping into a pair of women's shoes and stockings for a few moments so she can finish the painting on time. "Of course," he answers. "Anything at all." With that, one of the most passionate and unusual love stories of the twentieth century begins. When their portraits become wildly popular in 1920s Copenhagen, Greta encouraged her husband to adopt the female guise. What began as a harmless game led Einer to a metamorphosis and landmark 1931 operation that shocked the world and threatened their love. Looking ahead to next weekend, there is only one movie opening in wide release, the Christmas horror comedy Krampus. Adam Scott, Toni Collette, Allison Tolman, Emjay Anthony, David Koechner and Stefania Owen star in the latest from Trick 'r Treat director Michael Dougherty. Also opening in limited release are Spike Lee's Chi-Raq, Amplify's Christmas Eve, Cohen Media Group's Hitchcock/Truffaut, Sony Pictures Classics' The Lady in the Van, Freestyle Releasing's The Letters, Cinedigm's Life, The Weinstein Company's Macbeth, Saban Films' Mi-5, Atlas Distribution's A Royal Night Out, Drafthouse Films' The World of Kanako and Fox Searchlight's Youth. Be sure to check back on Sunday for the box office estimates, and again next Tuesday for our predictions for the first weekend of December. Until then, take a look at this week's projections below.